The ambitious aim of this colorful and comprehensive volume is to present the full spectrum of folk, country, and western music informally but in great detail for all those interested in this diverse field. One of a small handful of reference works devoted to this subject, it provides a wealth of information not available from other sources. The informal approach, as in Mr. Stambler's Encyclopedia of Popular Music, promises to appeal to many general readers; indeed, the book can be read strictly for fun, rich as it is in colorful characters and incidents. The approximately five hundred entries included range from biographies of the "classical" folk and country personalities, such as Woody Guthrie, Joan Baez, Eddy Arnold, and Ernest Tubb, to those of the folk rock and country blues genre, such as Bob Dylan, Leadbelly, and Muddy Waters. Whenever possible, biographical material has been drawn from direct interview. In addition to biography, the encyclopedic portion includes definition of terms and discussion of major classes of folk, country, and western styles. Some entries cover special events and shows from the Newport Festival to the Grand Ole Opry. Instruments are discussed, from banjo to sitar to zither; special emphasis is given the guitarits history, musical styles associated with it, some reasons for its popularity. 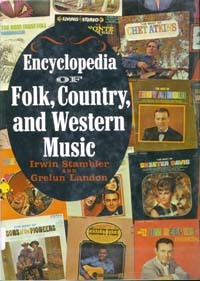 The book also includes three specially commissioned articles, by Sam Hinton ("Changing Attitudes Towards Folk Music"), Ed Kahn ("Country and Pop Music: Development and Relationship"), and Bill Anderson ("The Fall and Rise of Country Music"), as well as a comprehensive bibliography, discography; and nearly a hundred photographs. Irwin Stambler, a former popular song writer and radio commentator in the field of pop music, has in recent years divided his writing time between the diverse fields of science and popular music. His efforts in the latter field include magazine articles, editing Music West magazine, and the compilation of the Encyclopedia of Popular Music, published in 1965. Mr. Stambler has served as an editor with several national publishing companies and is currently associated with Ziff-Davis Publishing Co. He received his B.S. and M.S. degrees in New York University and studied journalism at Columbia. He lives in California with his wife Constance and their four children. Grelun Landon, after being graduated from the University of Southern California, spent many years working closely with many well-known country and gospel artists, including several weeks each year in Nashville and other southern towns working with writers and covering recording sessions. He was a vice president of Country Music Association, Inc., and is a lifetime member of its panel of selectors for nominees to the "Country Music Hall of Fame." Mr. Landon lives at Lake Sherwood, California, with his wife and their three children.